Gingham Goat: Drop cloth addiction! I have a serious addiction to drop cloth! I love love love the look of the material! Not to mention that you can get it at a serious bargain compared to purchasing material at a fabric store! I bought a 9ft x 6ft cloth and have gotten 2 french door curtains, a valance and a basket liner out of it! Pretty sure there's some good savings there compared to what you would pay for already made ones! 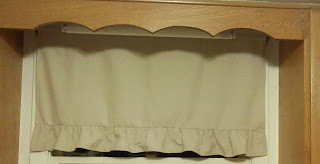 I don't have my french door curtains hung yet as I'm in the process of sanding and staining those but here is the valance I made. I'm a self taught sewer and am always quite excited when my projects turn out as I intended! I seem to do better with making up my own patterns then I do with using the store bought ones! For this valance I thought I'd try my hand at doing a ruffle. It turned out pretty good in my opinion! I have some serious plans for those cabinets too! Oh, and Im meeting my Aunt next month to pick up her old embroidery machine. How great would this fabric look with something embroidered in black? ?